Down to the wire here with Zoya's Summer 2011 collection with Faye, A bronzed mauve with purple and brown undertones flooded with right gold sparkle. A unique gilded shade that will work in any season. Yes, this is a 100% twin of OPI Rally Pretty Pink which will be reviewed soon here on PolishGalore. I thought I was going to obsess over this color - it looks like an orchid... it's purple, it's gold! What couldn't there be to love? 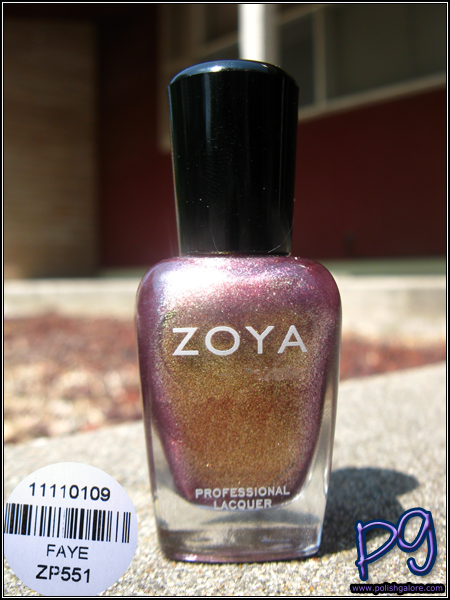 I used a base of Zoya Get Even, 2 coats of Faye and a top of Zoya Armor. Okay so in the sun, you see a bit of visible nail line (index finger) and the gold shows up but it's kind of weird. This color is more frost like? In the shade, it's like - hyper shiny with the gold and the purple is kinda pink? Indoors with the flash it's very purple orchid like, but not so much on the opaqueness? Lots of question marks from me because I'm just very confused about this color. I like it but I don't love it. I should love it. It's purple! But I'm rather jaded. I think I need to wear it a few more times so I'm not so on the fence with this color. Unlike the others which I've called glass fleck, lovingly, I'm calling this more of a shimmer. 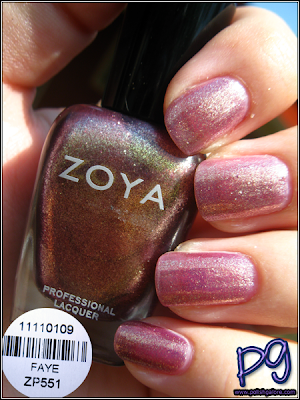 Zoya can be purchased on their website for $8/bottle. I feel the same way about Faye. I felt like I should LOVE her, but I'm kinda unsure. There was a LOT of shimmer, which kinda made her look rust-colored in some lights, which I didn't like. Such a pretty colour, I need to get my hands on this one! I LOVE this polish. Maybe 3 coats and you would have liked it more? ?